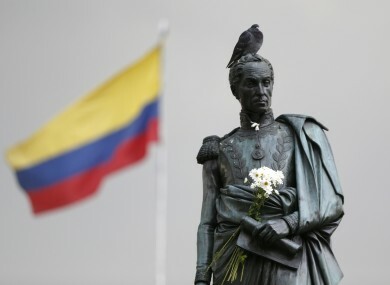 Flowers decorate the statue of independence hero Simon Bolivar in downtown Bogota, Colombia, in the days after President Juan Manuel Santos won the Nobel Peace Prize following the voters' narrow rejection of a peace deal with FARC. COLOMBIA’S GOVERNMENT AND FARC guerrillas will sign a new peace accord tomorrow, after a previous agreement to end their half-century-old war was defeated in a referendum, both parties said. Last month voters taking part in that referendum surprisingly snubbed the first accord. Critics said it went too easy on the rebels, who have been waging what is now Latin America’s last major insurgency. “The government and FARC delegations have agreed to sign the final agreement to end the conflict and build a stable and lasting peace,” negotiators from both sides said in a statement yesterday. The new accord was first announced on 12 November. The signing will take place at 11am (4pm Irish time) at the Colon Theater in Bogota. “We are working out the procedures necessary for this,” they said. “Whether the entire (current) text is voted on, or just the issues that have been sensitive and where there has been no agreement, we ought to do it by national referendum,” Uribe said. Santos’s government is scheduled to present its revised peace deal in Congress today to discuss its details. Santos called yesterday for it to be implemented quickly. “This limbo is increasing the risks,” Santos told reporters. “It is urgent that we move to the second phase of regrouping the FARC” for their demobilisation, he said. “Uribe misgoverned, corrupted and caused bloodshed in Colombia for eight years” when he was in office to 2010, said one of the FARC’s commanders, Pablo Catatumbo, on Twitter. He has never wanted peace, only the defeat of the FARC, which he couldn’t achieve. “But that is almost impossible to achieve” given the demands of Uribe’s party, Restrepo said. “And Uribe has no veto or blocking power,” said Restrepo. Commander Rodrigo “Timochenko” Londono and other FARC leaders arrived in Bogota on Monday to finalise the deal. Ahead of the referendum, the FARC’s 5,700 fighters gathered to wait in their jungle bases. The full peace accord aims to see them demobilise and disarm over the coming months under UN supervision. Email “Colombia's government will sign a new peace deal this week”. Feedback on “Colombia's government will sign a new peace deal this week”.